The ruins of a system of toilets used by crusaders in the Mediterranean have been found to be infested with parasites. The findings suggest that the sanitary conditions of the toilets were far from ideal and allowed for cross contamination between food and waste, which created this issue, according to The International Business Times. The island of Cyprus has been occupied by several different populations throughout the past thousand years. 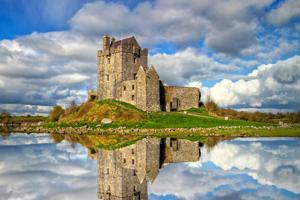 At the time the castle was built, the island was owned by the Franks, who purchased it from the English around 1200 AD. Soon after the Franks took over the island, they built the fortress Saranda Kolones. Soon afterward, the island was struck by a massive earth quake, thus destroying the fortress entirely, except for the toilets. Perfectly carved for human use, the toilets featured half-moon holes in a long bench for sitting. The waste would then go down from the toilets into a primitive sewer system, which was part of what allowed the parasites to spread. Two researchers from the University of Cambridge, Evilena Anastasiou and Piers Mitchell, decided to dig a little deeper into the ancient waste and see what they could find. Luckily, the remains of waste in the toilets were still able to be used. The duo was able to rehydrate the human waste and run it through an incredibly fine micro-sieve in search of parasite eggs. Each egg was smaller than a tenth of a millimeter. The results revealed that many of the crusaders suffered from two of the most common parasites: Whipworms and roundworms. While whipworms can cause certain infections, both worms are better known for competing with their host for food. When in high enough quantities, the worms harshly reduce the ingested nutrients from the food people consume, making them sick and possibly starving them. The researchers wrote "In these circumstances [it] is quite likely that medieval soldiers with a heavy parasite load would have been at increased risk of death from starvation during famine episodes such as long sieges or expeditions when supplies ran out," according to Live Science. These parasites would easily spread from human to human due to poor hygiene and sanitation in the bathrooms. The study of leftover waste in ancient bathrooms provides researchers with more detailed information about the health and diets of ancient people, though it's certainly not for everyone.